Illustration of the West German UFO Landing Incident. Recently, a former U. S. soldier has revealed his victimhood at the hands of a landed crew of UFOnauts whose technical prowess apparently exceeded that of any Earthling during the mid-1960's. The crew's summer-night intrusion at the soldier's infantry-training camp in Grafenwoehr, Germany, apparently included abduction of one or more fellow infantrymen and the disabling of their M-113 personnel carrier. A witness who served with in a West German weapons platoon for the U.S. Army recalls events from 1966, according to testimony in Case 63699 from the Mutual UFO Network (MUFON) witness reporting database. “I was in the weapons platoon of a rifle company in the (U.S.) Army. The weapons platoon was made up of four armored personnel carriers, which were 13-ton, lightly armored, tracked vehicles [M113]. Three of the APC’s were 81mm mortar gun crews, and the one I was in was the fire directions center. I was a driver at the time. “We, approximately 14 men, were on a training mission out in the field by ourselves. The gun crews had set up their mortars and the fire directions center had laid in the guns, which is sighting them using aiming stakes for the gun crews to put their sights on. “I was tired at dusk and rolled out my sleeping bag in a nice grassy area under a tree and beside my APC. Another sergeant did also. I went to sleep quickly. 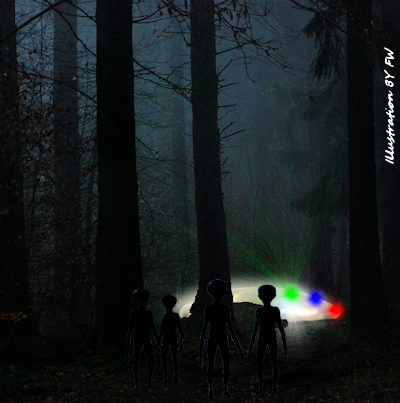 “Three men, one on guard duty, were watching a star or light in the sky apparently pulsing with different colors. Two of the men went on to their sleeping bags and the guard stayed up. My squad leader was on radio watch because we had been warned we might have aggressors trying to sneak up on us that night. “The next morning, I awoke to find several men talking in a group about not being woke up for guard duty. Just then my squad leader emerged from the APC and said he had fallen asleep at the radios for some strange reason. This had never happened to him before. “My platoon sergeant, one of the three watching the light the previous night, told of being in a dream state and hearing the guard yelling frantically for help. The sergeant said he couldn’t move, but could hear. “About 09:00 [AM] we heard and saw the guard that was on first watch coming down a hill about 200 yards away. When he reached us he was hysterical and crying. He said, ‘I thought all of you were dead.’ He then recounted his story. “When two of the three men watching the star the previous night went to bed, the guard went toward the wood line, where we had set up camp. The guard then turned toward a clearing to the west of camp and said a craft had landed there in front of him. It had numerous lights of changing colors all down its side. “He stayed with them until morning and then came back toward our position. Looking down a hill he saw a silvery, cigar-shaped craft still where it landed the night before. He ran back to the other GI’s and again begged them to come with him. They again refused to come. “He waited a few more hours and then came back to our camp when all of us saw him. He told us the story, and someone found the aiming stake he had thrown. “The sergeant that slept a few yards from me said he had the strangest dream of being examined in a brightly lit operating room. He also said he had an awful headache in the top of his head. Along with this, the grassy area where we slept appeared to have had a core sample taken from it. A round spot of grass and dirt a few inches deep were missing. The platoon sergeant recalled hearing the guard yelling desperately for help but he could not move. “My APC had the infrared lenses cracked and everything electrical was burned out. I remember the maintenance crew in our company asking what happened. They had never seen this kind of damage to a vehicle before. My APC had to be towed in to base that night, later to be sent back to Ordinance. “The Colonel, our battalion commander, wanted some explanation for all of the damages. When he was told, he said he could not file an official report, because only one person was a witness to the event. “My personal experience of that night involved a watch I was given for graduation. It was anti-magnetic and glowed in the dark, but that night it stopped working and glowing. I knew the guard who was on duty that night, and after the incident he was very emotionally disturbed. He was sent away and I never saw him again.